Five law-enforcement officers were killed and 7 others were wounded when they were ambushed in downtown Dallas on July 6. The shooting took place during the course of nationwide demonstrations against a rash of police killings in various regions of the United States. Marches have been held in Baton Rouge, Minneapolis-St. Paul, Chicago, New York City, Atlanta, Detroit, Chicago, Washington, D.C., Memphis, and across the U.S. In Dallas thousands have taken to the streets in solidarity with the struggle to end police brutality against African Americans. During the evening of July 6 shots rang out in the downtown area of Dallas resulting in the multiple deaths of both transit police and patrolmen. The corporate media attempted to take this incident and use it against the burgeoning movement against racist violence. These demonstrations and other protest actions are representative of the rising intolerance and commitment to eradicate the use of racial profiling leading to lethal force against African Americans. 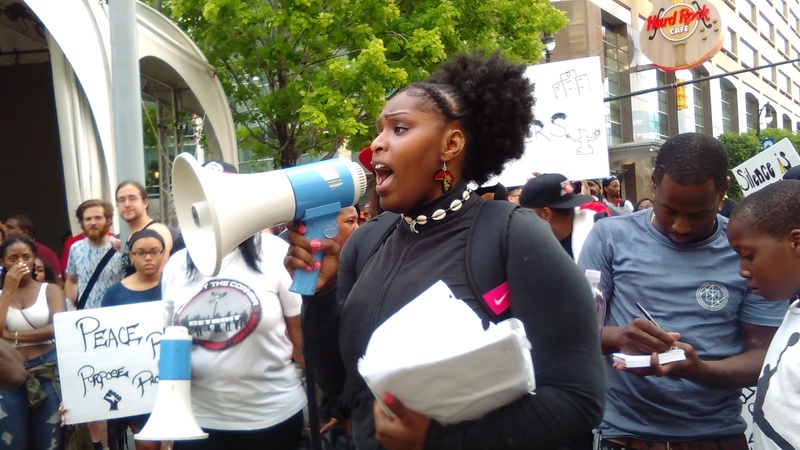 Over the weekend of July 8-11 thousands of people demonstrated around Baton Rouge demanding justice in the death of Alton Sterling who posthumously has been charged by corporate media with engaging in some form of “illegal commerce” as an alleged street vendor of CDs. Even if this was to be substantiated, and it has not, does this warrant extrajudicial execution by the police? These manifestations forced U.S. President Barack Obama to make a statement while attending a NATO conference in Warsaw, Poland where discussions were held aimed at expanding the European and North American military presence in Eastern Europe. In addition, the Pentagon occupation of the Central Asian state of Afghanistan will continue to be a focus of Washington’s foreign policy. The successive administrations inside the U.S. have all supported this militarism despite its repeated failures in Afghanistan, Iraq, Libya, Yemen, Palestine and other geo-political regions. The resources both human and material which have been wasted during the course of the last quarter-century of invasions, bombings, occupations and blatant interference in the internal affairs of other nation-states could very well have been utilized to maintain quality housing, the stabilization of communities, educational reform, universal healthcare for all residents of the U.S. along with a concerted campaign to halt and dismantle the repressive law-enforcement apparatus which systematically targets African Americans, Latinos and other oppressed peoples as well as the elimination of the racist prison industrial complex that houses millions of inmates along with those who are under judicial and law-enforcement supervision. Over the last three years anti-racist demonstrations have accelerated. The vigilante killing of Trayvon Martin in Sanford, Florida in 2012 gained attention exposing the fact that the lives of African Americans mean very little in a country that professes to be a paragon of human rights globally. In Baton Rouge, Louisiana on July 5, 2016, Alton Sterling, a 37-year-old African American, was shot numerous times even after he was tackled to the street by two white Baton Rouge Police Department officers. Police claim they were there in response to a report that a man dressed in red and selling CDs used a gun to threaten someone outside a convenience store. This police shooting was captured on video by multiple people at the scene. These videos illustrate the police attack and shooting done at very close range. The killing immediately sparked demonstrations in Baton Rouge. Consciousness around this killing prompted other demonstrations in the region and nationally. After a second shooting in Minnesota the U.S. Department of Justice (DOJ) announced that it would conduct a federal investigation. Nonetheless, several probes conducted by the DOJ in recent years have not resulted in civil rights or criminal charges being filed against the police and racist gunmen. Later on July 7, 32-year-old Philando Castile was shot to death sitting in his automobile by an as yet unidentified police officer in Falcon Heights, Minnesota. His companion Diamond Reynolds live streamed the entire incident over Facebook. This was a major contribution to the struggle against police brutality. Reynolds and her daughter remained calm despite the traumatic and outrageous attack. Even though it was reported that the video was soon taken down from Facebook it had already been downloaded and then shared on scores of other sites. In a matter of minutes and hours, Reynolds figuratively became the Ida B. Wells-Barnett of her day. Wells-Barnett, a school teacher and journalist, in the 1880s and 1890s, through her newspaper publications exposed the hypocrisy of the white racist rationales for the mass lynching of African American men. In the 21st century these assumptions about the African American people remain intact. Police agencies obviously train their personnel to view the oppressed African nation in the U.S. as a threat to the supremacy of American capitalism and imperialism. These killings are by no means isolated incidents but occur on a frequent basis. Varying reports related to police use of lethal force in 2015, indicates that anywhere between 975 and 1100 or more people died at the hands of law-enforcement in the U.S. Many others were injured and wounded as well as cited and taken into custody without probable cause. 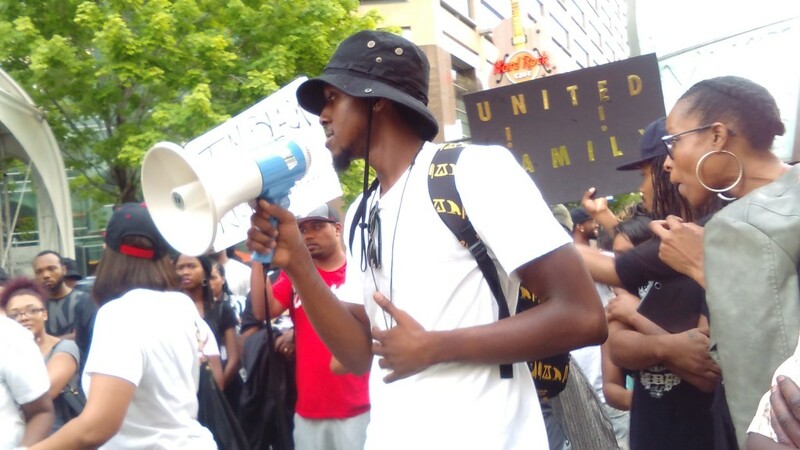 The police killing of Antwun Shumpert initially did not attract as much national attention as the violent acts committed against Sterling and Castile in Louisiana and Minnesota respectively. Nonetheless, in light of the protests sweeping hundreds of cities, more people have become aware of this development. African American advocates for Shumpert, particularly his family and attorney, linked the police killing to the history of racist violence in Mississippi. This southern state was considered one of the most notorious in regard to the highly exploitative system of slavery and the extra-judicial executions of Black men during the 19th and 20th centuries. Of course this statement by Atty. Moore echoes the mass sentiment of African Americans and others who are militantly opposing police brutality. The rapid wave of significant protests merely reflects the “tip of the iceberg” in regard to the groundswell of frustration and anger so prevalent among broad sections of people. There are trends within the political sentiment and demonstrations which suggest a renewal of the struggle for national liberation and self-determination. The re-emerge of hundreds of people waving the flag of the African American liberation movement (the red, black and green), suggests a rise in national consciousness which has revolutionary potential. No genuine transformation of U.S. society can effectively take hold without the acquisition of full equality and self-determination for the oppressed nations. Attempts to obscure this question by the ruling class through the presidency of Obama have not been successful. The lack of enthusiasm among African Americans during the Democratic primary and caucus process is a reflection of a mounting disenchantment among many with the two-party capitalist political system. Both the Democrats and the Republicans perpetuate the exploitative systems of national oppression and economic exploitation. In order for a broader and deeper movement against racist violence to solidify in the U.S. independent political organizations must emerge which challenge the ruling class right to rule over the working class and the oppressed throughout the country. Political change must not be merely cosmetic but real and the material force of this revolutionary movement must manifest a level of force and ideological orientation that has the capacity attract millions committed fundamental change.